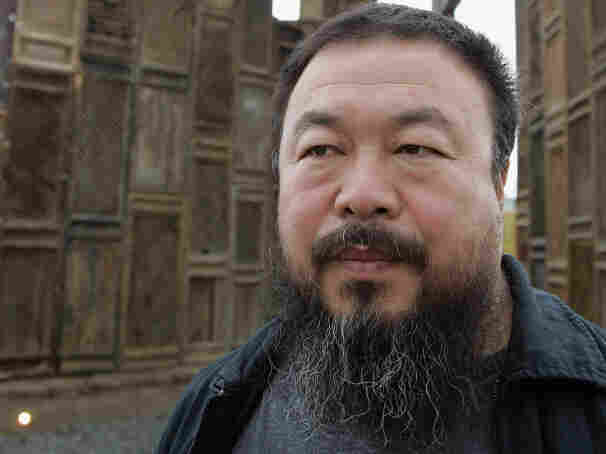 Chinese Dissident's Art Travels Though He Can't On Monday, an outdoor art installation by Chinese artist-activist Ai Weiwei will open in New York, but the whereabouts of their creator remain unknown. Ai was taken into custody by Chinese authorities on April 3. Chinese artist-activist Ai Weiwei was awarded the Chinese Contemporary Art Award for Lifetime Contribution in 2008. He was taken into custody by Chinese authorities nearly a month ago. Twelve large sculptures by Chinese artist Ai Weiwei will be unveiled Monday in New York, but the whereabouts of their creator remain unknown. Ai was taken into custody by Chinese authorities nearly a month ago and, according to his family, the government still has not told them where he is or why he was taken. Ai has always been outspoken in both his art and his life, but recent events in China and the Middle East have brought greater government scrutiny to one of the country's best-known artists. Two years ago, just before the Beijing Summer Olympics, I visited Ai at his sprawling studio complex in Beijing. At the time, the artist-activist was embroiled in yet another controversy: He had just quit the team in charge of designing Beijing's Olympic stadium — known as the Bird's Nest — calling China's attitude toward the Olympics a "pretend smile." Ai told me that he saw the moment as an opportunity to use the Chinese government's methods against it, and poke a hole in its public relations campaign. We spoke in a studio filled with assistants and freely roaming cats. I held a microphone in front of Ai as he snapped pictures of me for his blog. Before being taken into custody, Ai was a prolific blogger who wrote as many as five posts a day and put up hundreds of photos at that same pace. He told me that blogging was his creative response to being under constant government surveillance. In 2008, NPR's Laura Sydell sat down with artist Ai Weiwei at his studio in Beijing, where he kept his camera at arm's reach. "Instead of [letting] somebody monitor me, I put everything on my blog," he said. "They can just read my blog." Since 2005, Ai had been blogging at the invitation of Sina, one of China's major Internet portals. But instead of the celebrity blog the site had initially hoped for, Ai gave them a stream of government criticism. Sina eventually asked him to tone it down, but Ai refused. He told them, "'I believe in freedom of expression and you can always close [it] down because it's your company. But I will never do self-censorship. Either you close it up or I will continue putting those things up.'" Sina ultimately let Ai keep his blog, after moving it off the home page. According to independent art curator and critic Jeff Kelley, Ai is just as bold and confrontational in his visual art as he is in his activism. "He has taken the radical position of feeling as though it's his birthright to say whatever he wants to say," Kelley says. Still, Kelley says the message may be less direct in Ai's visual art, and therefore less threatening to Chinese authorities. Take, for example, the complex structure of the Olympic stadium, which could actually be read as a statement about democracy. "There's hundreds and hundreds of joints, none of them repeat themselves," Kelley says. "So in a certain way, it's a metaphor for the very idea of some cacophonous public speaking and it's a very democratic space." Painting 100 Million Sunflower Seeds: A Futile Art Endeavor? But Ai's works also play with what is sacred. In 1995, he created a series of photos that show him holding a valuable Han Dynasty vase, dropping it and letting it break into pieces. Melissa Chiu, director of the Museum at the Asia Society in New York, says the vase photos commented on what China was doing to its cultural heritage. "Great examples of architectural heritage were actually being destroyed to make way for new buildings," Chiu says. "And it was also a time when, within China, antiquities were not greatly valued. So he was kind of making a comment on this very particular moment." Chiu says Ai has also made something sacred out of the ordinary. For Sunflower Seeds, Ai commissioned a factory in China to make 100 million porcelain representations of the common Chinese snack. He then spread them across a floor at the Tate Modern in London. "So he's making something from every day into something very precious," Chiu says. "And if you've come across anybody who's been in London in the past few months, they've all got their handful of Ai Weiwei sunflower seeds." On Monday, 12 800-pound animal heads designed by Ai to represent the Chinese zodiac will be unveiled in New York at Central Park's Pulitzer Fountain. Larry Warsh, founder of the AW Asia art organization, is responsible for bringing the work to New York. He says the piece Circle of Animals/Zodiac Heads alludes to a recent incident in which two Qing Dynasty bronze sculptures of zodiac heads were put up for auction in Paris over the objection of the Chinese government. The sculptures were believed to be part of the famed 18th century fountain-clock at the imperial Chinese retreat at Yuanming Yuan. The heads disappeared in 1860 when the retreat was pillaged by French and British troops. "It does bring questions [about] looting and who owns what," Warsh says. Ai was scheduled to be in New York for the May 2 unveiling of Circle of Animals, but he's been in the custody of Chinese Authorities since April 3. Many western observers say Ai is being detained because of what he had written on his blog. Right after the 2008 earthquake that devastated China, for example, Ai began collecting the names of students who had died when poorly constructed schools collapsed. When the government refused to release the names of the dead, he posted them on his blog and built a wall for them. Critic Kelley remembers Ai showing him the work: "At that moment, something buckled in me and I said to myself, 'OK, is this art?' And then immediately I said, 'It doesn't matter. What matters is that he's doing it as an artist. He's doing activism as an artist.'" Ai collected more than 5,000 names and it was only after he released them that the government came forward with its own list. For a long time, it seemed like Ai's international fame gave him more leeway to be critical of the government. But the Asia Society's Chiu says that after the social media-spurred revolutions broke out in the Middle East, the climate in China shifted. "Now we have a situation where it's not just him, but scores of others that have also been detained," she says. Back in 2008, I asked Ai to weigh in the idea that his fame had given him more freedom to be critical of the government. "If that's true, that means I really have to work harder to make them more conscious about my existence," Ai said. "Because there [are] so many people who cannot have a voice." Ai paused, then asked, "How can you predict what's in a dictator's mind? You know if you really think about them, you are already a victim of them."